Kerlix™ AMD Gauze Banadage Rolls are 4-1/2” x 4.1 yard rolls impregnated with 0.2% PHMB (Polyhexamethylene Biguanide), a powerful yet safe antiseptic that has a broad range effectiveness against gram positive and gram negative microorganisms including some multi-drug resistant strains such as MRSA. This exciting new product provides healthcare facilities with a low cost, prophylactic method of treatment without changing nursing protocol. In addition to its antimicrobial capabilities, Kerlix™ AMD rolls provide fast-wicking action, superior aeration, and excellent absorbency. 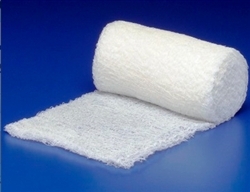 Kerlix AMD Antimicrobial Gauze Bandage Rolls can be used as a primary dressing to protect against infection. They can also be used as a secondary dressing to prevent bacterial penetration through and bacterial growth within the dressing.